Rents in prime central London fell in December, dropping by 0.5% as the ongoing troubles in the Eurozone and associated uncertainty in the finance sector combined to keep activity muted. Aside from a small 0.1% rise in April, rents have declined or remained flat throughout 2012 taking the annual fall in the sector to 3.2%. Among the worst performing areas are Marylebone and St John’s Wood which saw monthly declines of 1.2% and 2.7% respectively. St John’s Wood has seen rents fall 9.7% on an annual basis, the largest decline of all the regions covered by the index. At the other end of the scale, Belgravia and Hyde Park managed to buck the trend and saw rents rise 0.9% and 0.2%. Belgravia finished the year strongly with rental increases of 0.9% in the 3 months to December. While average rental price growth in prime central London remains negative, the appetite for properties from prospective tenants continues to be high and landlords will be encouraged to see that the number of new applicants and applicant viewings is up year-on-year by 24% and 4.5% in turn in the year to December. Additionally, the volume of new rental instructions has risen by 20% over the year to date, compared to the same period in 2011. This rise has been largely met by an increase in the number of newly agreed tenancies, which have risen by 36% over the same period. 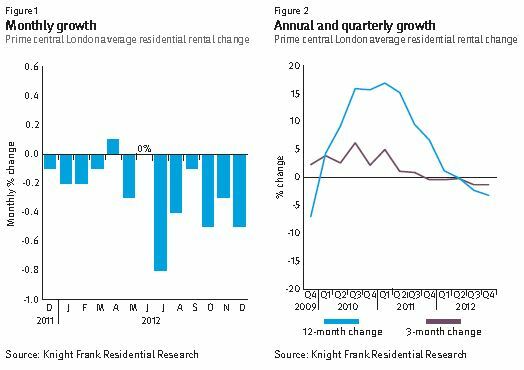 However, the health of the London economy continues to impact on rents and as the Eurozone crisis reinforces the downward pressure on growth, confidence and recruitment, affordability is likely to remain a central issue for tenants as we head into 2013. Unsurprisingly, given recent cutbacks in the city jobs market, the £1,000 to £2,000 perweek price bracket is expected to bear thebrunt of this market weakness, with the sub- £1,000 per week bracket likely to perform more strongly over the next 12 months. 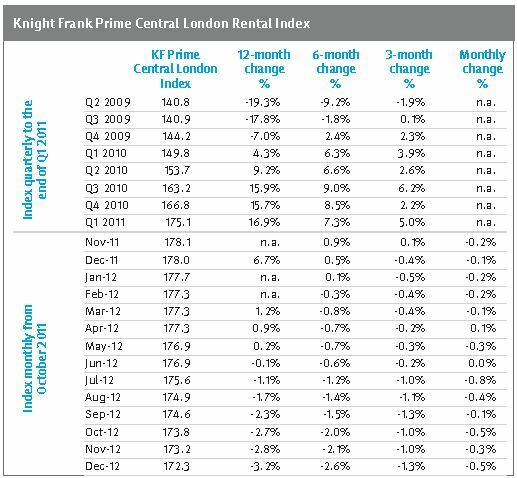 The Knight Frank Prime Central London Rental Index, established in 1995 is the most comprehensive index covering the prime central London residential marketplace. The index is based on a repeat valuation methodology that tracks rental values of prime central London residential property. ‘Prime central London’ is defined in the index as covering: Belgravia, Chelsea, The City of London, Hyde Park, Kensington, Knightsbridge, Marylebone, Mayfair, Notting Hill, Hyde Park, South Kensington and St John’s Wood. ‘Prime London’ comprises all areas in prime central London, and in addition Canary Wharf, Fulham, Hampstead, Richmond, Wandsworth, Wapping and Wimbledon.